OPEC and its oil market allies are widely expected to cut production at a critical meeting next week. OPEC believes it needs to throttle back output to balance the market after an oil price collapse, but Trump is urging the group not to cut. Analysts say OPEC, Russia and other producers may leave the market starved for details on their course of action, as they did at their last meeting in June. Russia's Energy Minister Alexander Novak, Saudi Arabia's Energy Minister and OPEC conference president Khalid al-Falih, and OPEC Secretary General Mohammad Barkindo attend a meeting of the Organization of the Petroleum Exporting Countries (OPEC) and non-OPEC producing countries in Vienna, Austria, May 25, 2017. When OPEC reached a deal with Russia and other producers in 2016 to end a two-year oil price slump, it was a relatively straightforward affair. The alliance announced it was slashing output, each country agreed to a specific production quota and international oil prices rallied about $7 a barrel. Heading into next week's OPEC meeting, few analysts anticipate such decisive action or so clear-cut an outcome — even with the oil market near the bottom of the worst price plunge since the 2008 financial crisis. To be sure, top OPEC producer Saudi Arabia and its Gulf allies are widely expected to orchestrate another output cut when producers meet in Vienna on Thursday. The signals are clear: Forecasters think the oil market will be oversupplied next year, the cost of crude has tumbled more than 30 percent in just eight weeks, and most OPEC members don't stand a chance of balancing their budgets at current price levels. But the group is dealing with a very different set of challenges than it faced in 2016, including a U.S. president who is fiercely opposed to price-boosting production cuts. Analysts now expect the meeting to culminate with an official statement that leaves the market scratching its head over just how many barrels OPEC intends to take off the market. "I do think there will be OPEC math," said Tamar Essner, director of energy and utilities at Nasdaq Corporate Solutions. "You'll have to figure out the cuts from baseline levels. I don't think it will be necessarily all that clear based on the statements." That could result in a repeat of OPEC's June meeting. With oil prices rising rapidly, the group agreed to reverse course and hike output but offered little in the way of a blueprint. The OPEC alliance agreed two years ago to keep 1.8 million barrels per day off the market, but by this last April, the group's output had fallen by about 2.7 million bpd. Instead of clearly stating they would correct by restoring about 1 million bpd, producers vowed to return to 100 percent compliance. The group also failed to release revised quotas for each nation. Markets responded to OPEC's ambiguity by pushing oil prices higher, the opposite of what the cartel intended. In the following months, U.S. crude rallied to a nearly four-year high at $76.90 a barrel, driven by fears of oil shortages ahead of U.S. sanctions on Iran. The price has since tumbled 35 percent over the last eight weeks, hitting a 13-month low at $49.41 on Thursday. 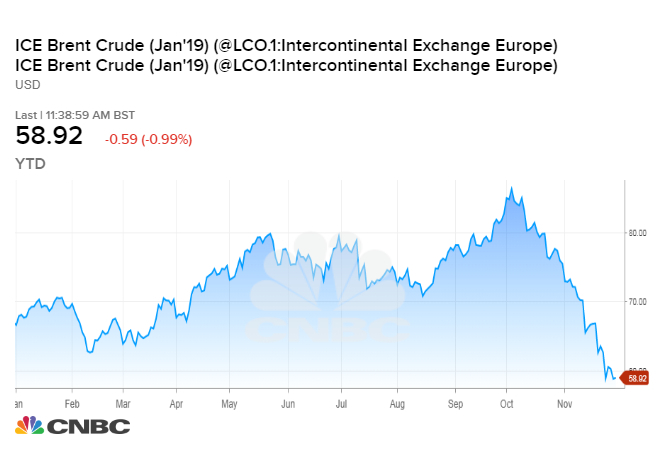 John Kilduff, founding partner at energy hedge fund Again Capital, says traders may punish oil prices if the OPEC statement once again disappoints the market. "If this OPEC meeting falls apart, you could see prices rapidly fall down to potential support down to $42," he told CNBC's "Power Lunch" on Thursday. "There is a zone of congestion on the charts ... between $45 and $50, so it will be a tough slog, but your downside objective is $42." OPEC's technocrats have signaled that the alliance needs to cut 1 million to 1.4 million barrels a day in order to deal with the looming oversupply. But sources recently told The Wall Street Journal that OPEC is wary of announcing cuts on that scale. That is largely because Saudi Arabia enters Vienna next week badly bruised by revelations that agents of the kingdom murdered Washington Post columnist and U.S. resident Jamal Khashoggi last month. President Donald Trump is standing by his allies in Riyadh, but he's made it clear that he wants the Saudis to keep a lid on oil prices in return for his loyalty. The upshot is Saudi Arabia must push through new production cuts without alienating Trump, who will be critical in shielding them from U.S. lawmakers. Trump's public criticism and his administration's back-channel talks played a role in persuading OPEC to hike output in June. One strategy reportedly under consideration would see OPEC announce that its members will maintain the quotas they announced in 2016. In reality, that would mean several key producers would cut output, since they are currently pumping above those quotas. Saudi Arabia, for example, is believed to be exceeding its 2016 quota by about 1 million bpd this month. Iraq exceeded its quota by about 300,000 bpd in October, while the United Arab Emirates topped its output cap by nearly as much. However, Saudi Energy Minister Khalid al Falih stressed this week that the kingdom will not throttle back output alone, and it's unclear whether it has support for this strategy. Offering fewer details provides OPEC members a way to paper over disputes on the final deal. Baghdad has historically resisted large cuts, saying Iraq cannot sacrifice oil revenues after weathering 15 years of war and unrest. Likewise, OPEC members Libya and Nigeria were exempt from the original deal in 2016 due to ongoing internal conflicts that curtailed their oil supplies. As of this week, they have not committed to cutting output, even though production has surged in Libya and ticked higher in Nigeria. On Thursday, Reuters reported that Russia and the nation's energy firms are moving toward accepting production cuts, after several weeks of noncommittal statements. However, analysts remain skeptical of Russia's commitment. Moscow can balance its budget with Brent crude around current levels, and cutting output requires negotiations with a web of partly state-owned energy firms and private companies. "I think its possible that Russia just won't be involved in any kind of tangible way," said Derek Brower, a director specializing in political risk at RS Energy Group. "If anything, Russia will give verbal endorsement to cuts but then in practice not really do much in terms of restricting supply." Brower also believes there's a high likelihood OPEC's official statement will leave the market parsing its policy. The key, he says, is the baseline that OPEC sets for production cuts. If the group sets the baseline at this month's levels, when Saudi output likely hit a record 11 million bpd, the cuts would have less impact than if they were compared to a month when OPEC pumped less oil. For the moment, those details appear to be undecided, and analysts say Saudi and OPEC leaders have been unusually quiet in the lead-up to the meeting. "I think everything is still in play," Brower said. "There is no agreement on the baselines as things stand. There's no agreement on volumes. There's no agreement on exemptions." "Our base case is that they're going to cut, but it's going to be underwhelming in a nutshell," he said.